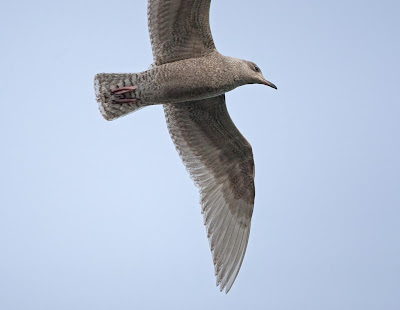 A juvenile Iceland Gull was found in the Harbour during the afternoon, but was only present for a short time. Another slow day for passage produced (south unless stated) 7 Red-throated Diver + 12 north, 1 Diver sp north, 2 Manx Shearwater north, 28 Gannet + 4 north, 1 Cormorant, 1 Shag north, 85 Pink-footed Geese, 4 Eider north, 19 Common Scoter + 5 north, 8 Black-headed Gull, 9 Herring Gull, 5 Kittiwake north, 3 Auk sp + 4 north, 2 Starling in off and west. Also seen in the Long Nab area were 4 Red-throated Diver, 4 Teal, 1 Merlin, 2 Razorbill, 2 Guillemot, 12 Snow Bunting, 4 Reed Bunting and 4 Lapland Bunting (2 of which came in off). Elsewhere the Great Northern Diver was still in South Bay and 3 Egyptian Geese and a Goldeneye were on Wykeham South Lake. A Long-tailed Duck was reported from Long Nab via Birdguides.